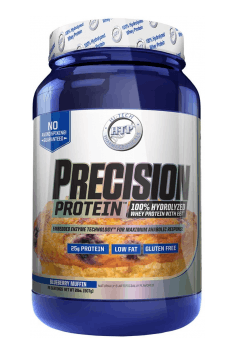 Hi-Tech Pharmaceuticals Precision Protein is a high-quality whey protein hydrolysate characterized by fast absorption time and high bioavailability. The supplement is distinguished by a low content of carbohydrates and fats, as well as an innovative EET ™ formula, helping to increase the availability of amino acids contained herein. As a result, the supplement immediately provides the necessary building blocks of skeletal muscle and promotes anabolism. Whey protein hydrolysate (WPH) – is one of the most popular forms of milk-derived protein supplement, subjected to the hydrolysis process. It is characterized by a good degree of bioavailability and fast absorption time, as well as a high protein content of about 80%. Hydrolysis allows reduction of the size of the amino acid molecule, which additionally speeds up the absorption process and does not burden the digestive system. WPH is distinguished with a fast absorption time, which is about 2 hours. The low content of carbohydrates and fats allows for immediate absorption of proteins from the gastrointestinal tract. As a result, WPH quickly provides amino acids to the muscles and effectively intensifies anabolic processes. Since the size of the protein molecules has been reduced in the hydrolysis process, they penetrate the bloodstream even more efficiently and quickly. The whey protein hydrolysate is characterized by a high level of bioavailability, determined on the basis of BV (biological value), which for WPH is as high as 104. This means that the proportions of individual amino acids are perfectly matched to the body’s demands, and they can be used according to the actual needs. In addition, the innovative Embedded Enzyme Technology ™ (EET) formula facilitates the breakdown of proteins and the release of individual amino acids, especially L-Leucine. L-leucine is an essential amino acid, and together with L-isoleucine and L-valine forms BCAAs, i.e. branched-chain amino acids. Its supply strongly stimulates the synthesis of new muscle proteins (MPS), even when taken in isolation from other amino acids. In addition, the EET formula increases its availability in the body, and thus along with other amino acids, l-leucine intensifies the process of building muscle mass. The supplement is undoubtedly focused on the building of qualitative muscle mass. Whey proteins have been additionally subjected to a pre-digestion process that facilitates the absorption of protein from the gastrointestinal tract. In addition, the EET formula allows the effective isolation of L-leucine, which effectively increases the rate of MPS and promotes muscle anabolism. What's more, the low content of carbohydrates and fats makes the supplement ideally suited as a source of protein after a workout, when it quickly provides building components to skeletal muscles. Muscle catabolism is the process by which proteolytic enzymes break down proteins into individual amino acids to obtain energy. After a workout, due to damage and micro-injuries, the breakdown of muscle proteins is intensified, which in the long-term may lead to a reduction of the muscle mass. Consumption of the proper amount of protein after training allows to inhibit the catabolism process and thus increase the advantage of anabolic processes over catabolic ones. In summary, Hi-Tech Pharmaceuticals Precision Protein is a high-quality protein supplement that effectively supports the process of building muscle mass. The pre-digested whey protein hydrolysate has been enriched with the innovative formula of Embedded Enzyme Technology ™, which facilitates the isolation of the key amino acid in the context of building muscle mass. The supplement is a wholesome source of protein, while containing minimal amounts of carbohydrates and fats. Mix 1 serving (1 rounded scoop) with 120-240 ml of water, milk, or juice in a shaker cup and shake well. For best results mix and drink immediately before and after a workout. For maximum results, take 2-3 servings daily. Do not use or take up to three times a day as a supplement to your daily protein supply. The supplement is ideally suited as a post-workout supplement that will quickly and effectively provide as much as 25 grams of wholesome protein. The supplement may also complement a daily demand for proteins, which, depending on individual differences and goals, ranges from 1.6 to 2.2 grams for each kilogram of body weight. In order to obtain the best anabolic effect, it is recommended to take supplement before and after training, not exceeding three servings a day. Hydrolyzed Whey Protein Phospholipid Matrix, Natural and Artificial Flavors, Lecithin, Creamer, Sunflower Oil, Xanthan Gum, Cellulose Gum, Naturally Sweet™ (Erythritol, Tagatose, Maltose, Xylitol, Sucralose), Enzymes, FD&C Red#40. Allergen Information: Contains Milk and Soy (Lecithin).